Off to Rangsit on Sunday. Due to us, as a family, having to report to a venue very close to the station at 7:30 am on Monday, the closer the better please. I've looked on Google but there seems to be few around there. May be due to the university being located nearby? 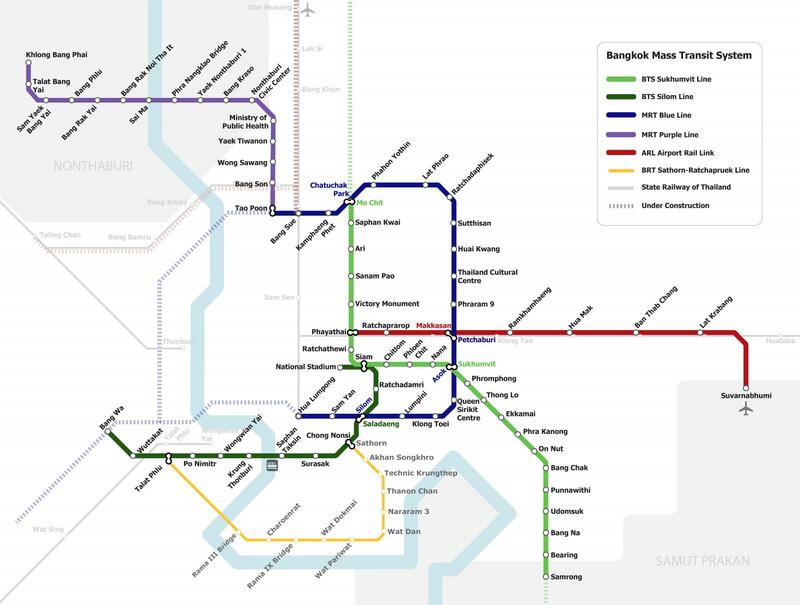 The MRT doesn't go anywhere near Rangsit. Think there are vans that go from Jatujak park up past Don Muang to Future Park, though. Kind of an official park n ride kinda thing, but it's probably around 20km. The Dark Blue and light purple ones are the MRT lines and stations. I hope they didn't say to get the MRT to Rangsit and it's just opposite the station. yep, though the srt red line (bang sue - rangsit) construction seems to be moving along at a nice pace. have you heard when it'll be done? There's no MRT or BTS going near there. It's around 5km west of Future Park, Around 25/30km north of central Bkk. 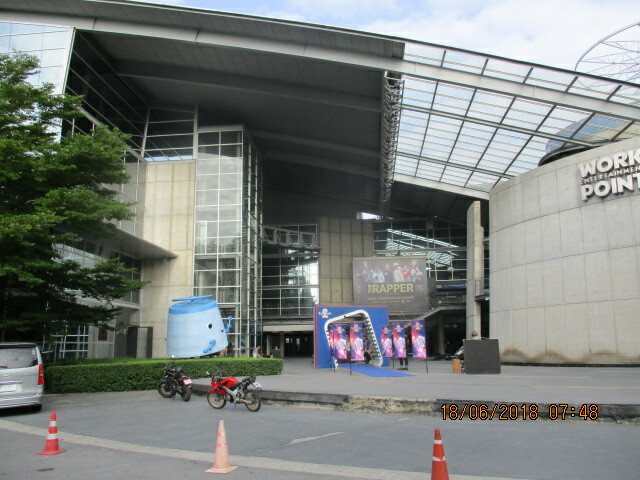 If you're travelling in from North/East you won't need to go into BKK, Just go West at Future Park. Which happens to have around 100 different roads coming together. If ya got a good GPS system in the car, go slow and zoom in. like luigi mentioned, there isn't any mass transit going that far north, yet. 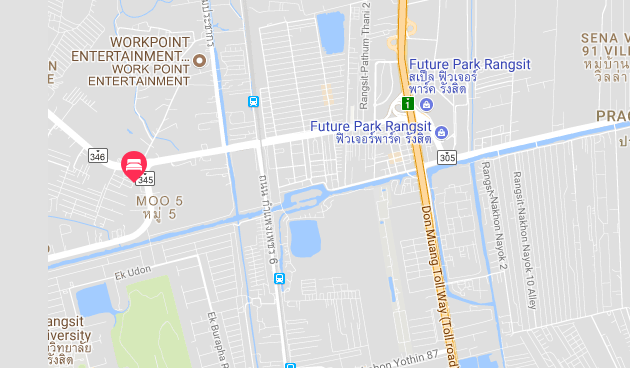 looks like your location is west of future park rangsit: you'll have to go by van, bus and/or taxi. taxi would likely be less than 500 baht from bts morchit, using the tollway. Right, have now found where we need to go. It's close to Rangsit railway station. Thanks to both for your assistance. All's good. It's close to Rangsit railway station. maybe luigi can elaborate more as i don't live in the area. IMO, taking the train from hula lamphong might make for a nice adventure for the family and then you'll have to take a taxi from the train station. though, if you're looking for the faster and more convenient route: take the bts to morchit and then a taxi to the apartment (will most likely end up being cheaper than the train for 3-4 passengers, too). Thread closed. Pragmatic and family now know where they're going, both venue and accommodation. Fcuk, how I hate going to BKK. There's a place called the Kan Mai near the train station. I didn't stay there once but read it was nice. I'd recommend it. Let us know what you decide to do, Prag! There's a place called the Kan Mai near the train station. Thanks CSFFan but please read the link in post #5. To be honest with all, the 'Kan Mai Nam' are rooms being let out. Something I found out on booking. 7 of which belong to 'Workpoint Entertainment Pcl' who are our reason for visiting Rangsit. I won't say too much at this stage but if things go well..................................... may be another thread. Not TGT but similar, so I'm told. My daughter did/done well and we now just have to sit back and see what comes of it. Twas a long day. Had to be at the studio for 07:30 and never got finished til 23:30. Daughter was paid 1,500 Baht, less tax, for performing. 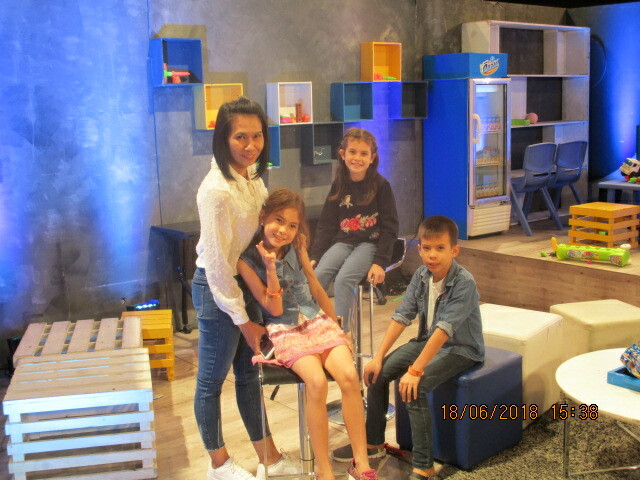 Studio audience were shipped in and were paid 500 Baht a head. Thanks for that Luigi. By the way the studios is right next-door to the Rangsit bus/coach station which is what I mistook for the Rangsit MRT. Hope that clears up my error in the original post? Last edited by Pragmatic; 02-08-2018 at 11:34 AM. Brilliant to see the kids enjoying the moment and having fun. Talented versatile and totally natural. They are a credit to you both. Hope they can go on and win. Rightfully, a very proud dad by the looks of it. It's only my eldest (10 Years). My other 2 just went along for the ride as we had no one to look after them. Anyways it's all down to my daughter herself rather than us as parents. Okay we finance her music lessons but it was her who wanted to be entered into the audition. She asked her mother to do a home vid of her singing after she came across a request on the net for children to enter a talent contest. I just thought it as a scam in getting us to pay a fee. They never asked for any money and after they'd received her vid she was asked to attend an audition in BKK. She and the missus went and I looked after the other 2. Obviously she passed the audition and went on to sing on the show in the vid. The vid was shown on TV on Saturday night. By Sunday morning she'd received over 200 requests as a friend on 'Farcebook'. So she's happy. You and the rest of the family must be very happy and proud. Not only the family. The locals are more geed up having someone living amongst them that has appeared on TV. The only locals to appear on TV before my daughter were in pictures of 'Thailand's most wanted'.